We made Colorful Pasta Sculptures! Inspiration comes from Storybook Art, by MaryAnn F. Kohl. Each art project in Storybook Art incorporates a book/illustrator and there are 100 ideas! The particular book that goes along with this project is Strega Nona, by artist and illustrator Tomie dePaola. This project and book particularly appealed to my 5 year old.....she loves any kind of building or sculpture project! This project requires some preparation of dyeing the pasta (or not) and letting it dry before the sculpting/building process begins. I would give about a day for dyeing the pasta and letting it dry. Here are a couple of our finished pasta sculptures. The first step is to either buy pre-colored pasta or to dye your own. To dye your own pasta, there are great instructions found here at eHow.com. You'll need to let the pasta dry overnight. It is a fun process and C and I have done before when we have made pasta necklaces. Once the pasta is dry you can start building! We used a low temperature glue gun , but you could also use white glue. With white glue, you will have to allow for drying time to ultimately hold your sculpture together. I supervised C closely when using the glue gun. Sometimes the strings from the glue can get frustrating, but the low temp glue gun is a great tool for fast building. To build the sculpture, we tried to begin with a larger base noodle like lasagna or a manicotti. Then we added smaller pieces on top one by one. 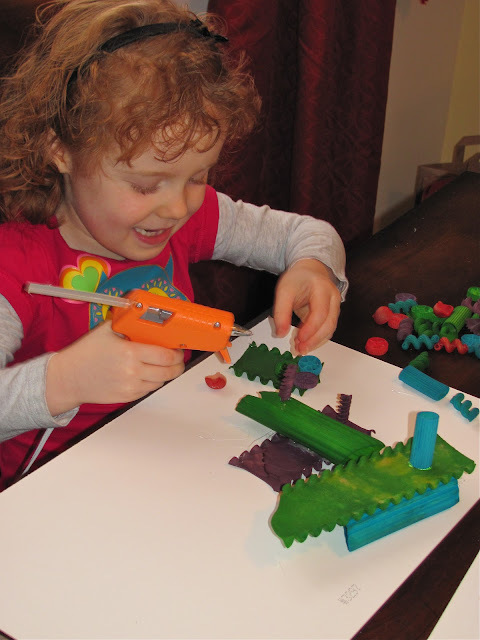 Here is C in action with her glue gun. She was very empowered with using the glue gun. This gun pictured is her own! Mostly all of our pasta sculptures became some sort of vehicle. Here is a race car. Our collection of 3 vehicles. They look very Dr. Seussish to me. What do you think? Not all of the sculptures were vehicles! Here is a self portrait of C. Notice the red curly hair, blue eyes, and purple hair bow! I love it! My daughter really enjoyed creating these Colorful Pasta Sculptures. The book that goes with the activity, Strega Nona , by Tomie dePaola is a favorite of ours too. It is a magical story about pasta! I highly recommend Storybook Art by MaryAnn F. Kohl for other wonderful literature/Art activities. Amazingly enough there are some Pasta sculptors out there! 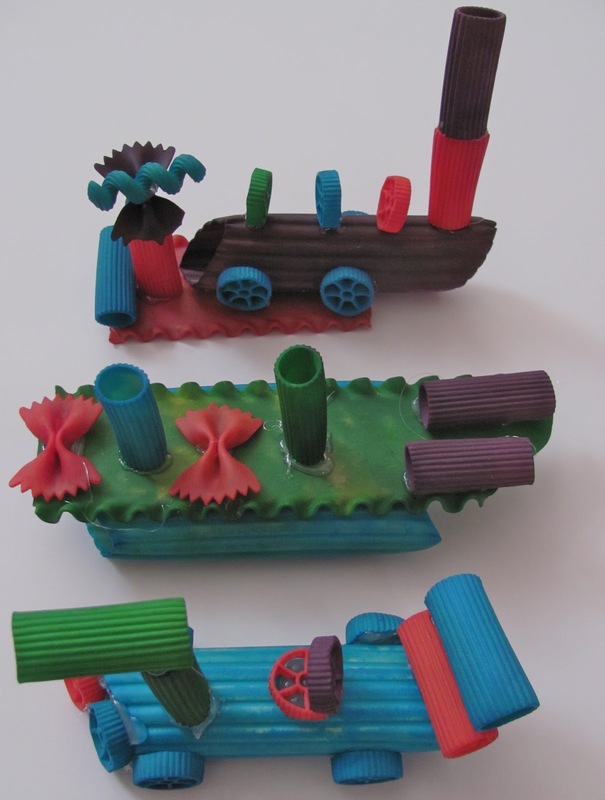 Here are some Penne Sculptures made by: artist: Eliza Tyrrell. Never would have thought? Here are some more pics of her Pasta Sculptures here. 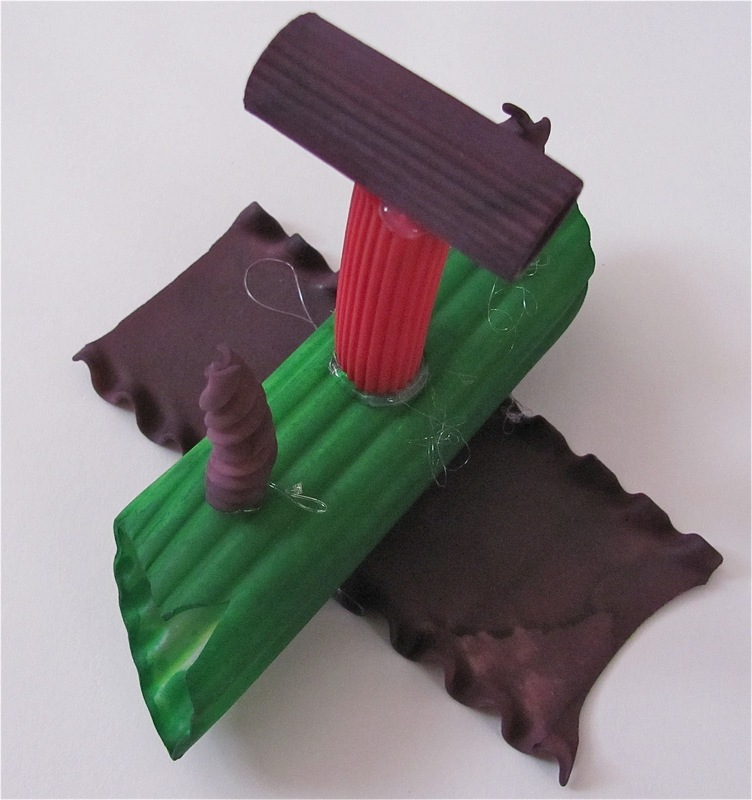 A pasta sculpture of The Chrysler Building is pictured here by artist Alex Creamer. 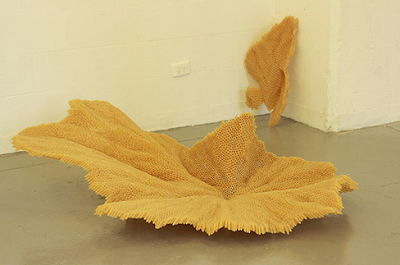 Some pasta sculptures by an art student from New York are pictured here. Macaroni sculpture from Flickr here. Are you inspired to create Pasta Sculptures? These are really neat and yes, they do look Seussish! I love MaryAnn Kohl's books too. Thanks Kelly! MaryAnn Kohl has the best books for childhood art and so prolific! Thanks Mariann, it was definitely fun! More to come! Fun sculptures! We have to make them! Thanks Esther! Would love to see your take on it! These are awesome!! You have really unique and fun ideas!! Thanks Roopa! You have wonderful ideas too! oh, we love to create with pasta so I instantly had to click over when I saw your photo/link! The sculptures are all wonderful (& yes I agree a little Dr. Seuss-ish) but my favorite is her self portrait! The curly red hair & bow made me smile! She did such a great job! Thanks Bern! The self portrait is great! Thanks! I know you and our girls will love this activity! Can't wait to see your take on it! This looks terrific, especially self-portrait. C is a creative little girl! Thanks! C is so creative, but in so many other ways too that I wish I could illustrate! That looks such fun and shows that what you can do with what you already have at home. brilliant. hi! I pre-school teacher. activities, liked it very much. There are different activities mainly mine. If you want to see, visit my blog. These scultures turned out great - I agree, there is a whimsical Dr. Suess quality to these vehicles! Cassie's self portrait is awesome! I enjoy the 3d art you and Cassie get up to, and as well that you have used Strega Nona - an old classic indeed! I plan to try to get Mary Ann Kohl's book as a resource, it looks excellent. These are truly amazing. I love all the pasta layering that was done. WOW! These are brilliant! I loved each and every structure. The self portrait is genius! You have the most fun ideas!